The evolution of drafting tables has been quite remarkable from a design standpoint. Before the rise of the Industrial Age, drafting tables were primarily found in the libraries and studies of upper class homes. Often richly ornate, these wooden desk-like drafting tables used a system of weights to tilt and hold the drawing board. They tended to be quite heavy, unlike modern drafting tables. The Industrial Revolution changed that, bringing drafting tables into the realm of the working class. As drafting tables left the homes of the gentry for urban offices, they became less ornate and more practical. They lost weight with streamlined designs and lighter manufacturing materials, gaining portability. 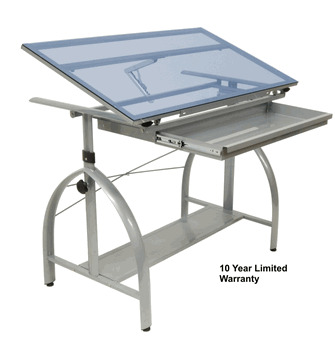 Drafting tables customized to meet the needs of specific industries and professions increased ease of use even further. Widespread personal computer use brought more drafting table changes, with some makers producing drafting tables designed to accommodate computer equipment. Communication technologies have brought the drafting table back home, to the home offices of professionals freed from office buildings by telecommuting, contributing to designs that are as stylish as they are functional. The sleek, artistic design of modern drafting tables is quite a change from the massive, bulky models of yesteryear. Glass and steel enhance function, in addition to the visual appeal of crisp, modern minimalist lines. A tempered glass top adds versatility in practical use because light can come through, making things like pattern tracing much easier. Easy adjustment technologies offer a height range between 29.5 and 38 inches and up to 30 degrees in tilt. Heavy grade steel and a floor leveler for each leg ensure stability. A slide up pencil ledge and unobtrusive drawer for drafting supplies add practical features without disrupting the sleek design line. No longer restricted to the libraries and studies of manors and mansions, freed from dreary workplaces, the modern drafting table has wide appeal. While still a part of the office, it is also seen in artists' studios, college dorms and homes. Today's drafting tables are appreciated as much for their pure functionality as they are for their attractive, clean modern look.